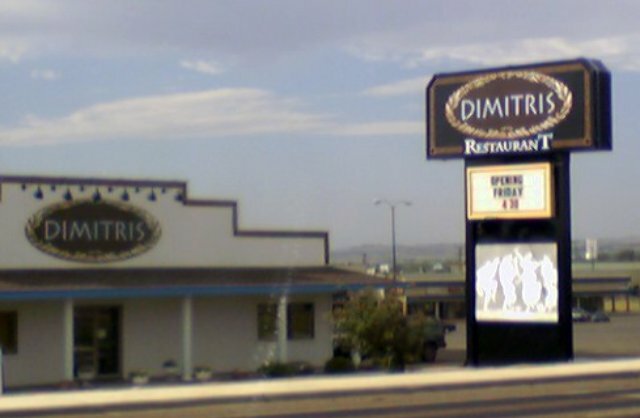 You are at:Home»Great Falls Montana»Around Town»Dimitris Opening! UPDATE: yep, I ate there on Friday night – will post a full review (and pix) later – in a word, it was AWESOME! Here is the full review (with pix)! Finally! Looks like the grand opening of Great Falls’ newest eatery – Dimitris Greek restaurant – is set for Friday (that’s tomorrow!) at 4:30 pm! Let’s all show up and give Jim and Jody a great turnout! That’s great news. Thanks for the info, Dave. You see, I LUV Greek food. It’s probably the best food in the world. I can’t wait. How about a review, Dave? Review will be coming up shortly — but until then, here’s my one-word take on my dining experience Friday night: AWESOME! Got some pix to share, too! I work at Dimitris and I know that Jim and jody have a hit on their hands and that this will be a GREAT addition to Great Falls. The whole Family is just wonderful and the food is great!